So I have been a bit lax on my blog posts…I apologize…but I jumped right into the month of June with no desire to stair at a screen anymore then I absolutely had. That said I have been overwhelmed with guilt and am going to hammer out a blog post. Summer so far has been great. While the drought is becoming a reality there is still fishing to be had and places to escape the reality that will I am sure hit everyone come late July/August…That said there has been some good news with regards to a possible El Nino year coming…A few of my good friends that spend countless hours guiding and fishing the Southern California Salt have been seeing signs of El Nino like they have never seen before over the last few months. Pelagic fish species that usually follow warm water currents well off shore are within yards of the coast and warm water currents are pushing up against the beaches and coast lines. While I understand very little about any of this people that I respect and who do KNOW about this have been telling me El Nino is coming…I hope they are right. Rivers like the Truckee and smaller streams are in big trouble. It is truelly saddening to see such a California Fly Fishing staple like the Truckee River essentially slowly die. I am not sure really what can be done or said then repsecting the fishery while it struggles and supporting the organizations that are tasked with protecting the fishery and who will be asked to rebuild it when the time comes. Lower Sac Striper Fishing – There is a TON of young stripers in the river right now. Lots of shaker size fish and 17-20” fish. The big fish seem to be slowly coming out of their shad coma and getting on the feed. I have had clients land and loose a few nice 20+ pound fish and have seen some pics from friends of bigger ones caught but I still think the big ones are yet to get going really well as the shad are just thinning out. 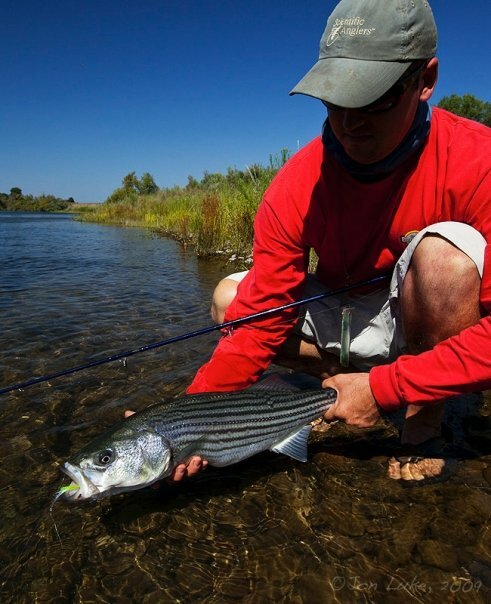 Late June –September is prime time and things are shaping up for a great striper year on the Lower Sac. Not a bad schoolie fish...fun fish! 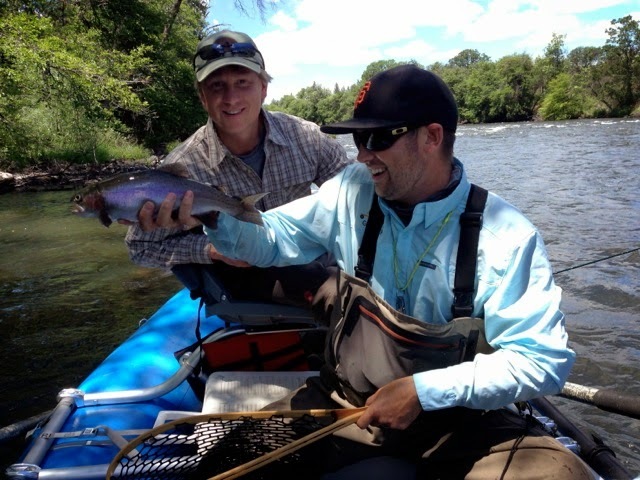 Lower Yuba River Trout – Flows on the Lower Yuba are at a really good level hovering around 1000cfs. I had high hopes for the fishing to improve as flows were raised to protect the king salmon moving up river but have yet to see the fishing really improve. I guided out there 2 days over the last week and fishing was fair at best. Morning was best and the bite seemed to get pretty tight midday. Hatches are minimal if non-existent from what I could see. That said there is a TON of caddis on the rocks and I have not been staying until dark when the caddis and PED hatches usually come off. I have been throwing some golden stone dries and hopper patterns in likely holding water as with the higher flows fish have been moving along the bank for shade and cover but had no luck. Most of my fish are coming on rubber legs and various caddis patterns. Not sure what to expect over the next few weeks to be honest on the Lower Yuba. Lower Sac Trout – spent a day or two floating from Jellys to Bend and summer fishing in that area is in full swing. Trout are in the rocks and swirls eating rubber legs, small stones, and caddis patterns. If you can stand the heat floating down low on the sac during the summer is a great option and should remain good through August. Pit River – Spent two days up on the Pit River floating Pit 1 and walk and wading Pit 3 for Clear Water Lodge last week. Both fished well and were a ton of fun. I love the Pit River and while fishing was a bit tough midday with the heat it was a pretty good. I think the Pit will be turning into a morning evening deal, like it usually does this time of year, pretty quick. One thing I do on the Pit when the bite gets tough is go down to a lighter tippet, makes it tough in the pocket water with a nice fish on but I’d rather have them on and loose them then not. Music Report – So I have been listening to a few older albums…Dave Hause’s Resolutions album a TON. This was released in 2013 but is one of my all time favorites. Just great Rock and Roll about life. Also I am digging the new Lucero song “Went Looking for Warren Zevons Los Angeles” they released off their new album coming out Sept 18 called All a Man Can Do”. The song reminds of older Lucero…That much Farther West era. The next release I am salivating over is Jason Isbell’s album coming out July 17th…Something More then Free. The two songs he has up on I Tunes so far are as good as anything he has ever released which to be honest is some of the best music out there I think. Sports Report – Giants are doing it man keeping in the hunt with realisticly pretty limited tools….2 starting pitchers down and Hunter Pence down and hanging a game or two out of first place in the West. In reality we seem to have no problem beating the dodgers what we need to work on is beating the rest of the division…getting swept at home by AZ and then taking 2/3 from the dodgers in LA is a bit weird but who knows. All I ask for is interesting and meaningful baseball through mid September and I am getting that. June 1st - Official start of summer....in my world. Summer is here. In my mind June 1 is the official end of spring and beginning of summer. That said the weather is still spring like as is the fishing…Lots of mid to high 80s and Low 90s in the forecast for the next few weeks fishing all over the place should keep plugging away…Here are some reports and what is coming up. Shad fishing remains fair to good. There are still plenty of fish around and while numbers caught each night have taken a bit of a dip the size of fish has increased with some nice females in the mix on most nights. I would imagine that shad fishing should remain fair to good over the next few weeks and began to tapper off the 2nd or 3rd week of June. Striper fishing is starting to pick up as some smaller keeper fish and shaker size are starting to be caught. I imagine fishing will get good over the next few weeks as the shad thin out and fish began to go on the feed. Best time of year for striper is June-September. There are still some prime dates open in June-August. Large and Small Mouth Bass fishing remains good. We are starting to see some smallies up in the shallows and catching a few large females full of eggs as well as some smaller fish in the creek mouths and shallows. Sight fishing for largemouth and top water fishing for largemouth continues to be a great option on most evenings as well. Small Jaw from the Lower Sac. 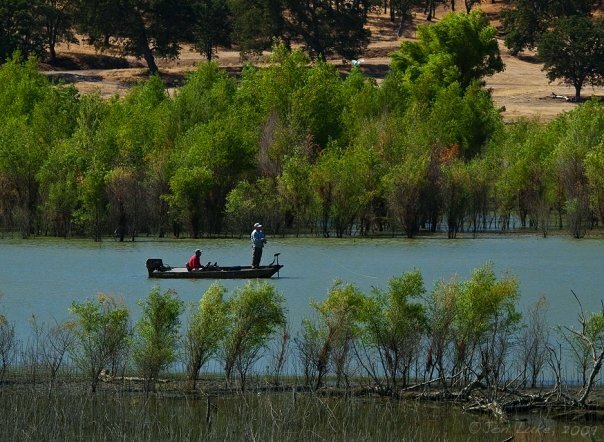 Lower Sacramento Trout: fishing has been fair to good. Pretty standard numbers of trout being caught on most floats. Options for numbers and size of fish right now just depends on how one floats and fishes the river. The Lower Floats are a great place to fish June-August. I look forward to getting out of the motor boat mid summer and floating Jelly’s to Bend each year and fishing for trout. Clearwater Lodge Water: Pit River, Fall River, and Hat Creek are all fishing well from what I have heard. I will be up there guiding a few days in June and look forward to getting my feet wet and running my raft down the Pit. All these rivers are such a treat to go fish as they are one of few places I get to go “close by” that feel like I have traveled “far away”. NF Feather River and NF Yuba River from what I have heard are both fishing well. Both fisheries will be in trouble this summer with the low water so get your licks in over the next month as I imagine these will get tough come July/August. Time to get out on the NF Feather! Lower Yuba River is fishing fair to good depending on the day from what I have heard. I have not been over there lately but flows are hanging around 850cfs which is low but not “I wouldn’t go” low. 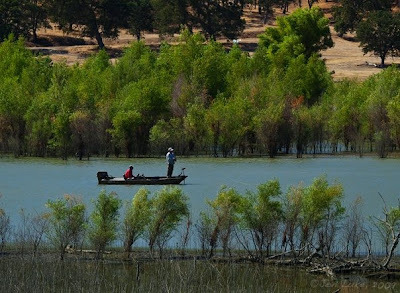 June is usually a GREAT month on the Yuba as it gets very little pressure as people are fishing on all the mountain trout rivers and pass right by the Lower Yuba. There is plenty of hatches and opportunity to fish some great Caddis hatches in the evening. Sports News: The Giants are playing great baseball even though they split a 4 game series with the Braves over the weekend. They had the shot to win Sunday but an bad error by Ryan Crawford cost them the game as well as the fact Sergio was not able to pitch left Casilla in some unfavorable matuch ups. Not a problem though they are .5 out of first and have been looking really good through the month of May. Curious to see how 3rd base shakes out now that Casey is down in Sacramento and how Cain comes along. Overall when I look at the pitching rotation they have been rolling out and the line up they post every night I am pretty stoked to be only .5 out of first place. In other sports news this last weekend was one of the best for college baseball, the Regional Round of the NCAA Div 1 College tournament. I would say it rivals the basketball tourney in my book…even may be cooler sense I am not as big a basketball fan. The college game of baseball is so much fun to watch as it is so fast passed compared to pro ball. The aluminum bat changes the game in huge ways for the hitters and pitchers. I watched a lot of innings of college ball over the last 4 days, even a 14 inning Cal Bears WIN over Texas A&M at Texas A&M. Music News: So, Summer is concert season right…so I have already bought some tickets to see Built to Spill in Sacramento in July and put a Rocky Votalato and Dave Hause concert in SF on the calendar for August. Jason Isbell is also playing in Reno August 9th and I haven’t got tickets yet but I am sure I will.…I also put a bunch of local chico bands that I like on the calendar for local shows. Also my new band Royal Oaks is recording in June and should start playing some shows in June/July around chico…so lots of music over the next few months. Also some new albums coming out I am fired up about. Jason Isbell has a new album “Something more then Free” coming out July 17. Great summer driving music, The Chris Robinson Brotherhood has a new album coming out tomorrow June 2, just in time for long summer road trips.